CST LaserTRAC (L-TRAC Glow Red) 2545W(GL) Backlit Trackball with scroll wheel. Large ball for precise fingertip control. Large scrolling trackwheel roller for scrolling. Three easy access buttons with 1,000,000 cycle microswitches. Stainless steel support axles. Striking Backlit Translucent Red Ball with a black case. This classic curved case trackball design won numerous awards and was originally sold under the brand name "MicroSpeed" before the product line was purchased by CST. Hundreds of thousands of units based on this design have been sold and are still in use. While retaining it's great, field proven case design, inside the case the L-TRAC is a completely new trackball. Completely redesigned electronics featuring the highest performance pure optical tracking system available. 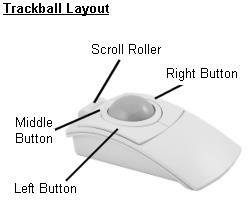 The trackball's tracking resolution can be selected in hardware from 400 dpi, 800 dpi (default) or 1600 dpi. Scream across even the largest displays with a flick of your finger with pixel by pixel control when you need it. Awesome for first person shooter PC gaming. Plus the L-TRAC now has full scrolling capability with it's large roller trackwheel. 100% MADE IN THE USA. A great desktop trackball for your home or office. Installs using USB interface port. Black case, Translucent Red Ball. The CST2545W(GL) contains a Backlit Translucent Red Ball that Glows a Vibrant Red. Note: LED lights only Turn On when the ball is moved and automatically Turn Off after 5 minutes of inactivity. Dimentions: 7"(L) * 4"(W) * 2.5"(H) (at crest of trackball) in.